Pros: Reliable services, good up-time, unlimited features. Cons: No varied pricing structures, no set plans, unhelpful support. Bottomline: A decent web hosting service with reliable uptime and great features, however slightly adequate support and limited pricing options. iPage is a web hosting company based in the United States which was founded in 1998. Having been in the business for more than fourteen years, their presence on the web is sadly not widely recognized, however hopefully the services that they provide can change that for the better. The iPage website itself is professional, informative and definitely aesthetically pleasing. It without a doubt meets the standard you would expect from a company that has been in the business this long. Also, at the top of the homepage, there is a small dropdown menu that allows you to change the currency in which you purchase your hosting services, with five different currencies available to choose from. This is the first time I’ve seen something like this, and found it very welcoming. Personally, I really do wish more hosting companies did this, as it is a pain converting dollars to pounds so often! iPage use a fairly common pricing structure, which is ultimately giving unlimited (using the term ‘unlimited’ loosely), disk space, bandwidth and other features. They do, however allow you to choose how long you wish to host with them. They do offer frequent discounts as well, however the average monthly cost seems to be between $2.95 and $4.95. iPage do not offer monthly, semi quarterly or quarterly pricing structures. This is indeed a pain, and I wish all web hosts would jump on the ‘varied pricing periods’ band wagon however it seems this will forever remain a dream. As far as features go, they offer pretty much everything you could ever want; unlimited domains, mysql databases, e-mail addresses and much more. They also offer a free site builder/blog for the inexperienced user. If you do not own a domain, you are given a free one for the life of your hosting account too. iPage also offer a one-click software/script installer, which includes the likes of blogs and online stores, which is mentioned on the features page. They also offer something similar which goes by the name ‘Script Library’. They also sport an ‘anytime’ money back guarantee. If for whatever reason you decide to cancel, they will refund you for the remainder of your host account. Also, if you decide to cancel within the first 30 days of your hosting account, you will be refunded in full. They do mention, however that if you register a domain with them, you will have to pay a domain fee. This fee allows you to transfer your domain elsewhere. Something odd I noticed during my review of iPage, however is that there is no mention of FTP accounts on the ‘features’ and ‘web hosting’ pages. This may be a feature that is limited or completely unavailable. IPage have a different kind of terms of service page. Instead of one long page full of text, it’s broken down into several links. Around thirteen links in total make up varied policies, acts and forms. However, when taking a look through, some of these pages were quite long, and all combined would probably make up around three ToS pages. I read through some of the policies and acts, such as the user agreement, and the acceptable use policy, and to no surprise, they were filled with legal jargon. However, this agreement is pretty much the standard you would expect to see upon reading it. The cancellation policy states that you are entitled to a full refund within the first thirty days of receipt. It also seems iPage do not have an uptime guarantee of any kind. After the initial sign-up process, I received a few of the expected e-mails; a confirmation of my services, an invoice and a welcome/getting started e-mail. Now, most getting started e-mails tend to annoy me as they do not include the desired information I wish to have. This was definitely not the case with iPage. The main body of the e-mail started off by thanking me for hosting with them then proceeded to inform me how to get started. It also told me how to set-up e-mail, gain traffic, and how to make use of scripts such as blogs. There was also a sidebar with all my important information with links to areas like account settings, control panel, user guides and support information. It also told me vital information like account login information, nameservers and mailbox server information. The amount of times I see an e-mail like this when I sign up with a web host is very few, so iPage instantly won me over with this. When logging into the control panel, I was immediately surprised to notice that they did not use the industry standard cPanel control panel. They instead made use of the vDeck panel. The panel itself looks very professional and sleek. It makes use of a sidebar and modules to separate important information and applications and scripts. The ‘Website’ module even has an item dedicated to the WordPress platform for ease. I decided to give the vDeck script installer ‘SimpleScripts’ a spin and see what it had to offer. The script installer offered a ton of scripts, more than I thought I’d initially see. It contained popular scripts such as Joomla, Drupal, PHBB3, and many more. It also contained some modules I didn’t expect to see, such as mailing list and live chat scripts. vDeck is certainly impressive and one heck of a contender against cPanel. I went ahead and installed the script Joomla, and it was as easy as I had initially hoped. I clicked on the script, clicked the ‘Install’ button, and it prompted me to choose what version I’d like to install, and any additional information I wanted to enter, such as user data and site information. As usual, I went ahead and monitored the uptime and downtime of the website for the period of one week using a service called Pingdom. I was happy to see that iPage only suffered one downtime occurrence, which only lasted five measly minutes. 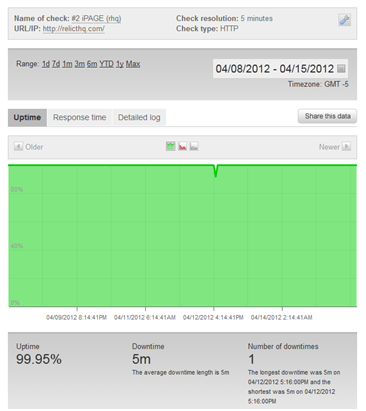 iPage sat comfortably at 99.95% uptime. This is certainly a strong number and I am definitely impressed that the up-time was that high. iPage are doing a good job of keeping websites online! iPage offer a telephone support service as well as a live chat support service. It seems they do not offer any kind of e-mail or ticket support however. They have a services information ticket form, as well as a form for account specific enquiries. iPage could certainly make use of using a ticket and e-mail system, however it seems that they are living in the era of live support and believe in giving their customers answers to their questions as quickly as possible, and I can certainly support that. Ramon Riley: Hi, how are you today? Smair: Hello, I’m fine thanks, and you? Ramon Riley: I’m great, thank you. How can I help you today? Smair: I was wondering how I would go about submitting a html website to google? Ramon Riley: Are you referring about Google Analytical tool? Smair: No, I meant using meta tags, and so on. Ramon Riley: To submit your website, you can use Google Webmaster tool. Smair: How would I go about doing that? That conversation was short and wasn’t particularly friendly besides the first response. It took around seven minutes to be acknowledged by someone to help me with my query, and it took around three to four minutes per response. Their customer service representatives really let them down on this one, because live support is supposed to be fast and easy. Also, I was given a robotic answer to my question, in fact, the conversation itself pretty much felt completely robotic. I was given a link to a product page to a tool I knew nothing about. I wasn’t given helpful step-by-step instructions; I wasn’t given a direct link to a helpful article listed in their knowledgebase, no, I was given a link to a webmaster tool. I may be coming on a little harsh here, but hey, support representatives should really try and help their customers with whatever queries they have, even if they are simple. iPage are a good quality ‘unlimited’ host that offer all you could ever want in a web hosting plan. They carry great uptime results and are a reliable service for the price. The custom control panel they offer is definitely of high standard, as is the script installer. iPage however should execute more payment plans as roping in customers for a minimum period of one year isn’t as enticing as one would think. Also, they should re-consider the way they handle their customers during technical support issues as making customers wait is not an option. The representatives should be more friendly and helpful as opposed to cold and short. 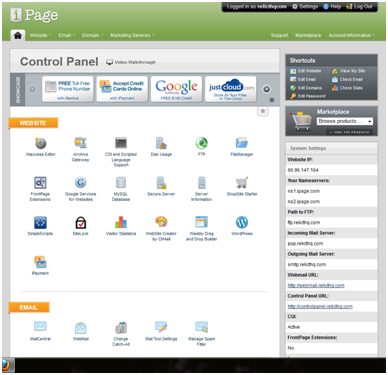 Disclosure: Web Hosting Craze has an advertising affiliation with iPage. You are right. Sometimes the support team acts like they are robots or something. Their replies don’t even make sense. I run a small blog network, so I need quite a number of unique C-Class IP’s. I took a punt on Ipage as they appeared on page 1 for “cheap web hosting” (I should know better). The automatic renewal was $119! (when converted from GBP) That’s only a 600% increase on the promo price. Absolutely disgusting! To make matters worse I then switched to one.com (who I find to be much better if a little less feature rich) and the process was painful. The re-pointing of the domain was almost impossible to locate as they have 3 different sections in the C-panel that do the same thing. When I thought it was repointed, the hosting expired and the site was down for 2 days whilst support “looked into” how to change DNS settings. Fortunately the site is rubbish and nobody cared (even me) but it was enough for me not to trust them. My rating is definitely 1 star. I have never heard of them actually and even though they have been around that long they still only garner 3 stars? You would think by now that they have things together and are on top of their game. Let me tell you about my 6 months experience with ipage and why I will never host my websites with them. I was attracted by their low price, but for something as simple as php version 5.4 I had to pay an extra 3$ a month making me pay 5.5$ a month. The interface is not convenient. No cpanel and the worst interface for the databases and the emails. They flicker once or twice with every simple action. The worst problem is that I had experienced blank screens for months. Some days every other time that I tried to surf my websites I got blank screens. After spending hours with the tech support who seemed to blame me for the problem, they finally admitted the problem was on their side, but even then they didn’t fix the problem. With the new host the problem disappeared. They also have a no refund policy, so I didn’t receive my money back for the six months that my website is not hosted on their servers (I paid for a year in advance). For all of these reasons I will never host my websites with ipage.